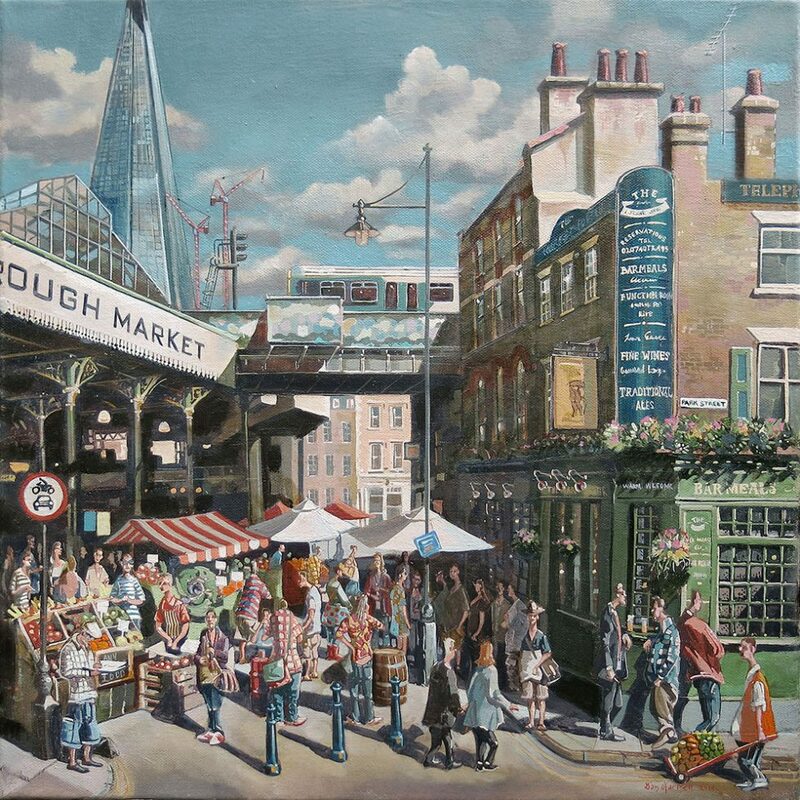 I was recently asked to produce an oil painting of The Market Porter pub in Southwark’s Borough Market. 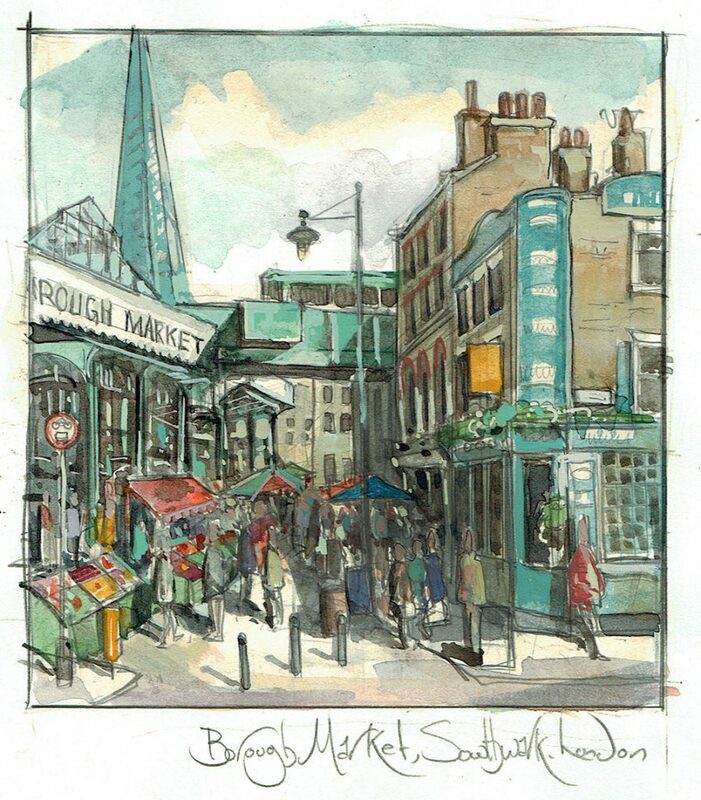 Borough Market sits at the south side of London Bridge. Records tell us that a market has been on this site since the 12th Century. However, there must have been a market way before that as London Bridge was the only bridge across the Thames during the Roman period. It’s inconceivable that there wasn’t some kind of market or other at this key trading bottleneck. In early times, the south side of the river would not have been seen as London but as Southwark and thus outside the jurisdiction of the City of London. So the laws in Southwark were a little more relaxed than its neighbouring city and it gained a reputation for a being a bit of a party town that included gaming, theatres and prostitution. A modern equivalent would be Las Vegas, this being in the US state of Nevada which has a more relaxed laws compared to the wealthy California on its western Border. As in Las Vegas today, all those nefarious activities gave a kick-back to the local land owner/hoodlum/enforcer who, in this case, was the Bishop of Winchester! It reached the height of its popularity in the 19th century when London was the world’s largest city. It not only benefited from its location but also from fortuitous proximity to the Pool of London docks. Today you can find the country’s finest fruit, vegetables, fish and meats of almost every verity. It makes a great day out. The retail market operates on Wednesdays and Thursdays from 10 a.m. to 5 p.m., Fridays from 10 a.m. to 6 p.m., and Saturdays from 8 a.m. to 5 p.m. The wholesale market operates on all weekday mornings from 2 a.m. to 8 a.m. The building on the right hand side is The Market Porter public house. The name ‘The Market Porter‘ is Victorian and coined in the 1890’s. Its previous name was The Harrow and it may have had other names prior to that as records tell us that there has been a pub on this site from 1638. There is a theory that the pub’s name was changed to The Market Porter in the 1990’s because the location was the site of a rather grizzly and bizarre killing. One ‘Flash Alf’ got mighty drunk, and then became abusive with another local named Edward Lamb. Well, Edward eventually lost his temper, and promptly bayoneted ‘Flash Alf’ through the eye with his umbrella, killing him on the spot. Six people gave testimony at The Old Bailey confirming the murder though a carpenter named Alexander Brims testified that ‘Flash Alf’ slipped, then impaled himself on Lamb’s umbrella. It sounds very implausible to me but the jury acquitted Lamb of the crime, and he was set free. My personal feelings are that Alf was a bit of a local thug, and probably ‘asked for it’ in the local Cockney parlance so the jury let the fella off. The Market Porter meets Harry Potter. In the film Harry Potter and the Prisoner of Azkaban the building next door, beneath the bridge was the site of The Third Hand Book Emporium and you see that big three decker bus pull up outside. The Market Porter pub is used for the interior of the emporium. You occasionally get Muggles joining the ‘Harry Potter walks’ piling into the bar for a spot of lubrication. 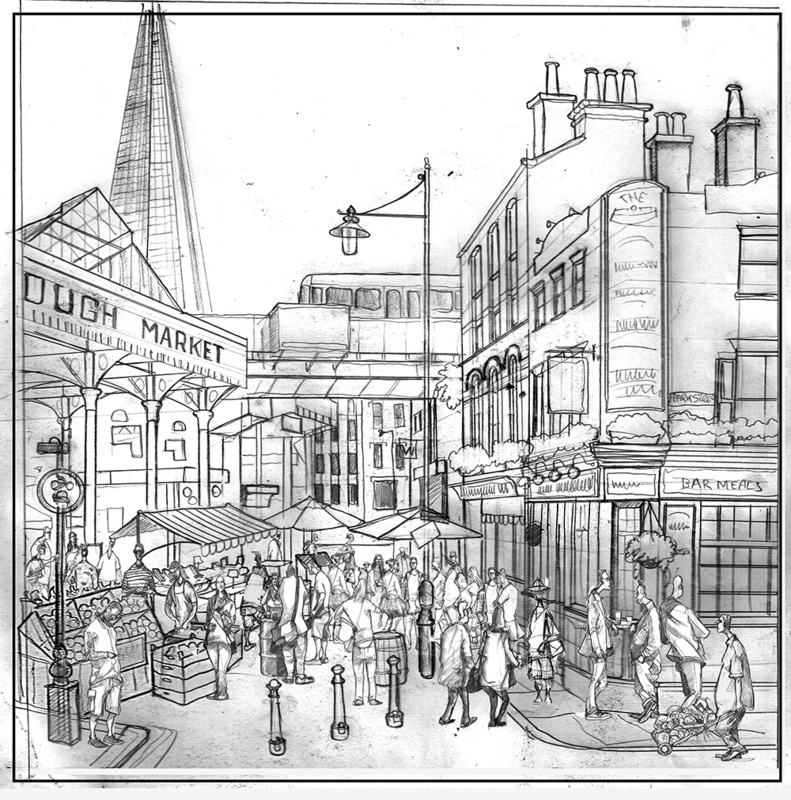 If you are in Borough Market then have a few beers in The Market Porter. it opens at 6am on market days!